Ranging in size from an olive to a small plum and spherical to ovoid in shape, Longans have a thin brown exterior that is rough and prickly. The easy to remove shell, called a pericarp, covers a grayish-white translucent pulp. In the center of the juicy flesh is a large smooth jet-black seed with a white ovoid characteristic mark. Having a flesh reminiscent of a peeled grape, the flavor is wonderfully sweet and often described as a mysterious tasting blend of musk, spruce and gardenia. Longans are available fall through late winter. 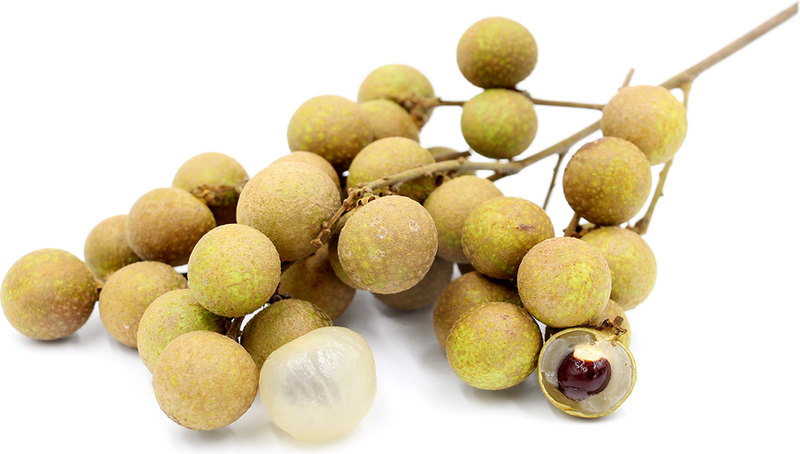 The Longan is native to China and India one of the most prized fruits in Southeast Asia. Botanically classified as Dimocarpus longan, its Thai name is Lam-Yai. The Chinese dubbed it "Dragon's eye" because of its white eye-shaped mark on the pit. The Longan and its close relative the lychee were introduced to the United States by W. N. Brewster, a missionary in Fukien Province, China.